Half the fun of watching CSI years ago was the over-the-top crime scene technology that detectives had at their disposal. Their impossibly-capable photo-processing software could turn a handful of pixels into a poster-sized print. It was equal parts ridiculous and hilarious, which is probably why this voice-controlled, image-enhancing browser game is so much fun. Written by Nicole He, ENHANCE.COMPUTER puts you in the role of Detective CYB3R who wields some of the most advanced image-enhancement and crime prediction software ever developed. 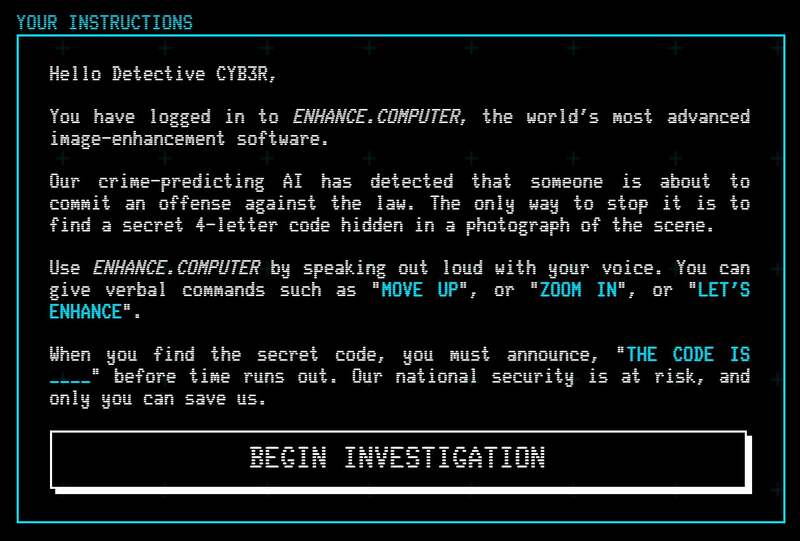 Your goal is to spot and report a small, four-digit code hidden somewhere on a grainy image before time runs out, but the game can only be played by shouting a handful of voice commands, including “zoom in,” “move left,” or “enhance,” at your browser.